This section will explain the structure of the RadBreadcrumb's template. Here is a snapshot of the template generated in Expression Blend. 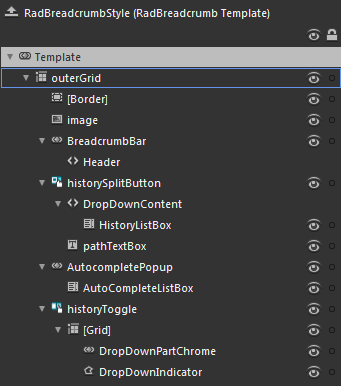 outerGrid - is of type Grid and represents the layout root for the template. [Border] - hosts the RadBreadcrumb control elements and is of type Border. image - is of type Image and represents the BreadcrumbItems Image. BreadcrumbBar - that is a mandatory element from the RadBreadcrumb template used to display the Breadcrumb items and is of type RadBreadcrumbBar. historySplitButton - a RadSplitButton that is used to display the History dropdown content. HistoryListBox - a ListBox that represents the list of visited paths. pathTextBox - the TextBox, where destination paths are entered. AutocompletePopup - is a Telerik popup that is used to provide auto-complete options. AutoCompleteListBox - is a ListBox that represents the list of auto-complete suggestions. historyToggle - a RadToggleButton that is used to display the History ToggleButton. [Grid] - represents the host control for the History ToggleButton. DropDownPartChrome - represents the visual appearance of the historyToggle button and is of type ButtonChrome. DropDownIndicator - represents the arrow indicator for the drop down part of the historyToggle button and is of type Path.